My wife and I are wearing these costumes. The idea started out with me joking to my wife that she should dress up as the Bride, and snowballed into us both making these costumes. 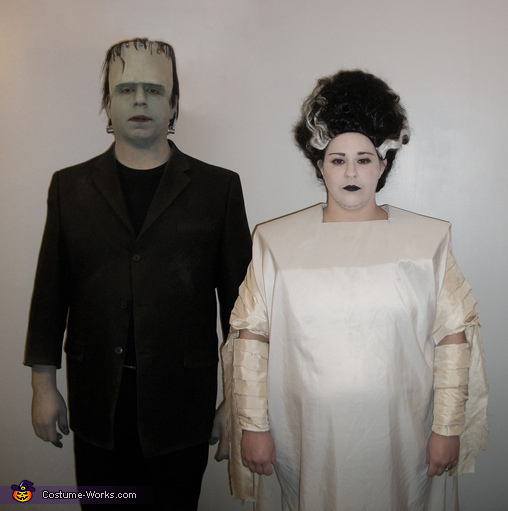 Both of these costumes are entirely homemade (except for the Bride's hair). I taught myself basic molding, sculpting, and latex casting to make the Monster's forehead. It was quite an adventure and it could have turned out better, but for a first attempt I am happy. The hair was all hand glued onto the latex headpiece a few strands at a time.The neck electrodes were 3d printed. The suit jacket and pants were a Goodwill find that I then modified by shortening the sleeves and adding weathering using watered down acrylic paints. The Bride's white dress was made from a set of white bed sheets from Walmart. Her sleeves were actually made from a curtain from our house. My wife thought the fabric looked perfect, so we bought a new curtain for our window and she cut up the old one. The crazy things we'll do for a costume haha. She did all the makeup herself using white foundation, a setting powder, and a black eye pencil for darkening her eyebrows and drawing on the chin stitches. She also put on a set of fake eyelashes to complete the look. We had a lot of fun and received quite a range of reactions. My wife wore her costume to work for a costume contest, and had a co-worker who was too afraid of her to talk to her all day. This was the most elaborate pair of Halloween costumes we've made so far, and we are already looking forward to what we will come up with next year! Happy costume making everyone!